Okay, let’s not talk about the fact that it’s almost one year since I last posted anything. 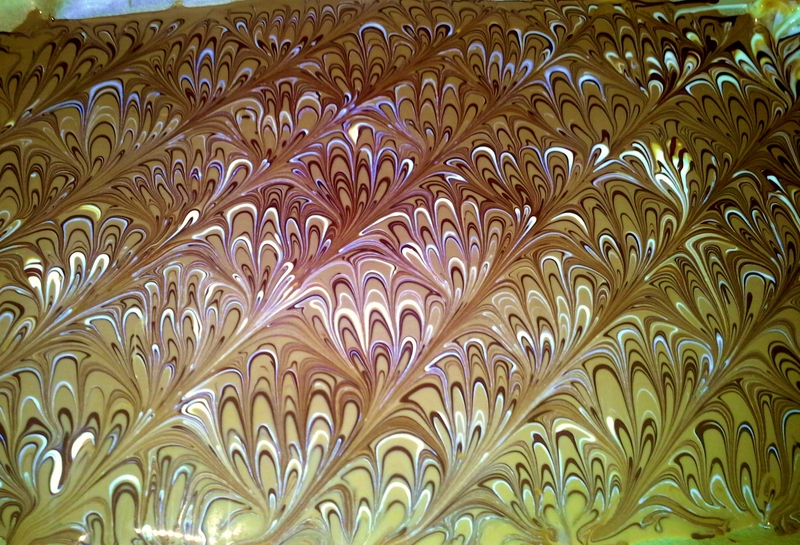 Let’s talk about marbling. 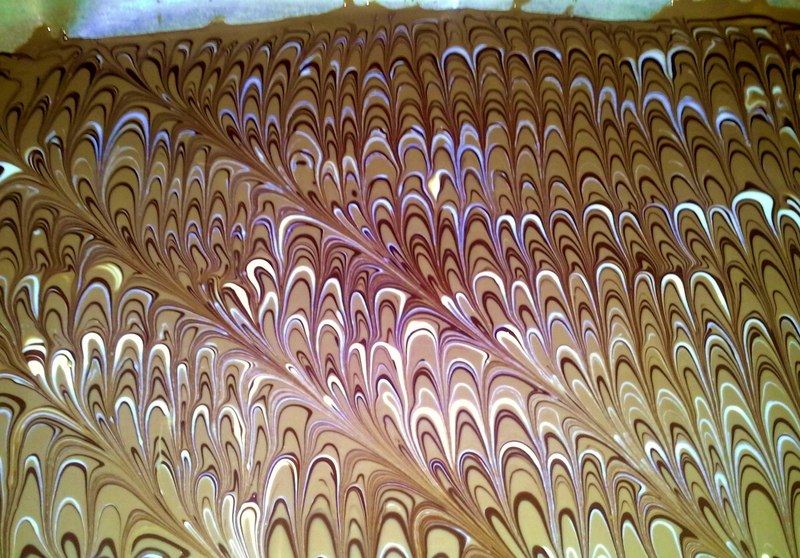 Mmm, marbling…. and let’s talk about chocolate. It looks fantastic. And tastes wonderful. And is actually very easy to make. Melt milk chocolate and coconut oil and stir them together. Put a piece of parchment paper (that is, baking paper, not actual parchment – since this is mainly a bookbinding blog, I thought I should add that) in a large pan or a tray, anything with a flat bottom. Spread the ice chocolate on the parchment paper. 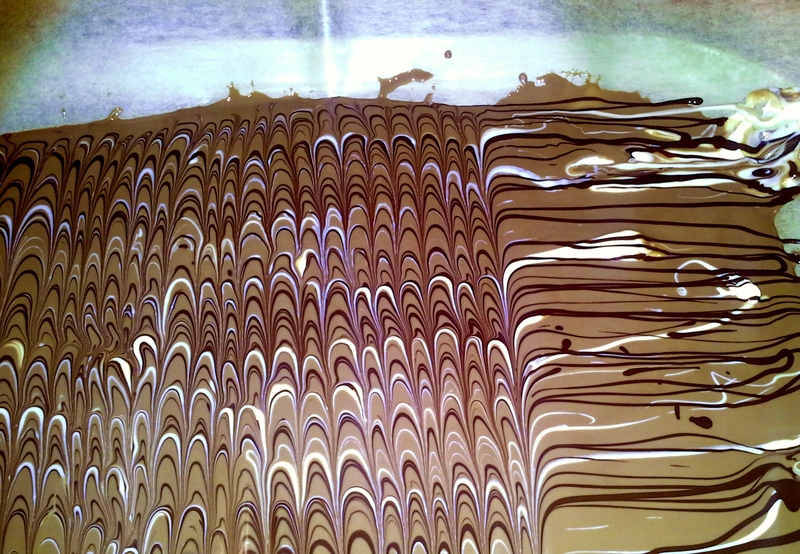 Before the chocolate hardens, melt the white and the dark chocolate, and use it to make a lot of horizontal lines across the ice chocolate. The white chocolate might be a bit hard to do fine lines with, it usually only want to come off the spoon in big clumps. That’s fine. It’ll be pretty in the end anyways. Use the end of a match or something else (I used a large knitting needle) to draw lines across the white and dark chocolate. Draw them pretty close together. 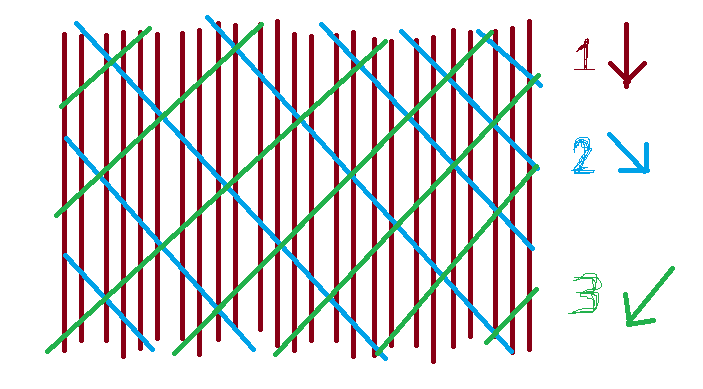 Be careful so that the needle or match doesn’t drip chocolate all over your pattern. Put the chocolate to cool in the fridge for at least half an hour, and you’re done! Now you just have to take a picture to show me!